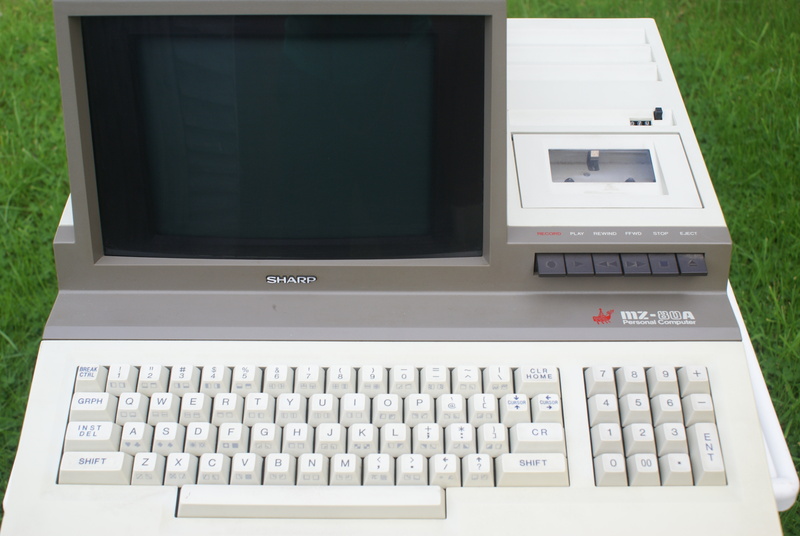 Unlike many other 8-bit computers of the era, the MZ-80A is only equipped with one single source of interrupt. Under normal conditions of use this interrupt occurs as part of the Real Time Clock. After 12 hours have elapsed an interrupt happens which takes care of the switch-over from AM to PM. The trigger for this interrupt is the Intel 8253 chip within the MZ-80A and, more specifically, one of the 8253’s counters. The 8253 chip has three countdown counters. The first counter is used for producing sound (and is a square wave generator, more on this in the ‘Sound’ section of this site). The second and third counters are linked together in hardware and this cannot be undone. The reason for this is that Sharp intend for them to be used just for the RTC. The input clock to the second counter is an unchangeable 31.5Khz. This is divided down to 1Hz by this counter (which is set as a rate generator). The output from this counter is hard-wired to the input for the third, and final, counter. This counter is usually set to a value of 43200 to begin with (which is the number of seconds in 12 hours). As the second counter is effectively giving a 1Hz input to this third counter, we now achieve an interrupt once 12 hours have elapsed. The interrupt occurs because the third counter’s output is gated with the MZ-80A’s interrupt mask and it is also set up to be an “interrupt on terminal count” type of counter. However, if you are prepared to abandon your need for an RTC (and I’m sure this is not a problem for most people writing games), we can instead commandeer the 8253 to give us the kind of interrupts we might need to cause interesting effects on the CRT screen whilst not interfering with the smooth running of our games. The only issue with doing this on the MZ-80A is that of synchronisation. Some computers of the era are able to specify an interrupt point during screen frame display, others (like the Amstrad CPC) have several known points during screen draw when interrupts are guaranteed. As the single interrupt we are using on the MZ has nothing to do with the screen, we must anchor it to the start of screen drawing with our only available means. This is the wait for vsync. The only way to achieve this is, as you will see, to ensure that your very first interrupt handler always waits for vsync to occur. This is the only way we can guarantee the kind of timings and positionings on the screen that we need to create stable, guaranteed effects with no loss of position and also no flickering / tearing. One last point is that the 8253’s counters are very tricky to code for with respect to the screen. They always take one single clock cycle (and this is not the Z80 clock we are talking about, it’s the input clock to the counter) to change their value to a new value. You must take this into account when coding a screen effect with interrupts. Even at the 8253’s fastest possible countdown (with the 2nd counter inputting as quickly as it is possible to the 3rd counter) we are still only able to create a new effect once four scanlines have passed. We cannot do anything earlier than this. You could, of course, switch an effect on for one scanline and off for another in the same interrupt handler but you would still have to wait four scanlines before another interrupt could occur. Unfortunately, there is no easy rule to screen draw-related interrupts on the MZ-80A, it is mostly trial and error. You just have to ensure that your very last interrupt handler happens no later than the last 4 scanlines of display, otherwise when you jump back to your first interrupt handler it will wait for vsync after vsync has already occurred naturally and you will simply see a lot of flickering or other bad visual effects. This routine uses the MZ-80A’s interrupt (triggered by the 8253 chip) to create a single bar (8 pixels high) of inverse at the top of the screen every single frame. The interrupt handlers are very short routines that take very little processing time away from any main program code. The 8253 chip is programmed by sending a relevant control word to memory mapped I/O address E007 which will tell each counter how it should behave. Then counter #2 is loaded with a value (at address E006) and counter #1 is also loaded with a value (at address E005). The interrupt occurs when counter #2 has reached zero. Again, all code shown is in the format acceptable to Avalon’s Zen Assembler and I realise that this program could be written in a far more condensed way but I have made it this way to show exactly what is going on step by step. PUSH BC                      ; not need to store all of them. PUSH HL                      ; interrupts into BASIC code. LD DE,MYINT2                 ; with inverse on. MYINT2: PUSH AF               ; Preserve all registers. PUSH BC                       ; Wait a very tiny 8-bit counter delay. INC HL                        ; values immediately when written to. MYINT3: PUSH AF                ; Preserve all registers. LD (HL),00H                    ; acknowledges the new values in this handler. MYINT4: PUSH AF                ; Preserve all registers. LD HL,0E006H                   ; interrupt occurs. MYINT5: PUSH AF                 ; Preserve all registers. PUSH IY                         ; out the sync with the display. INC HL                          ; code as we can per frame. And here is the same routine in BASIC, naturally it strips out a lot of stuff that is unnecessary once you are in the BASIC environment such as setting up a stack (we don’t want to mess with BASIC’s stack) and preserving Zen’s vector at 1039 – 103A as Zen isn’t loaded and, obviously, also the loop that waited for the Spacebar to be pressed before exiting as we want to immediately return to BASIC once the interrupt has been set in motion. Please also note, although there is an impact on the speed of BASIC it is not very noticeable. If you’d like a copy of this BASIC program to run on your MZ-80A then please find it in this folder here. Please note it will NOT work in an emulator as I have yet to find an emulator that can handle the kind of display effects we are creating here. As shown in the video above, the file is called BASIC-INT.